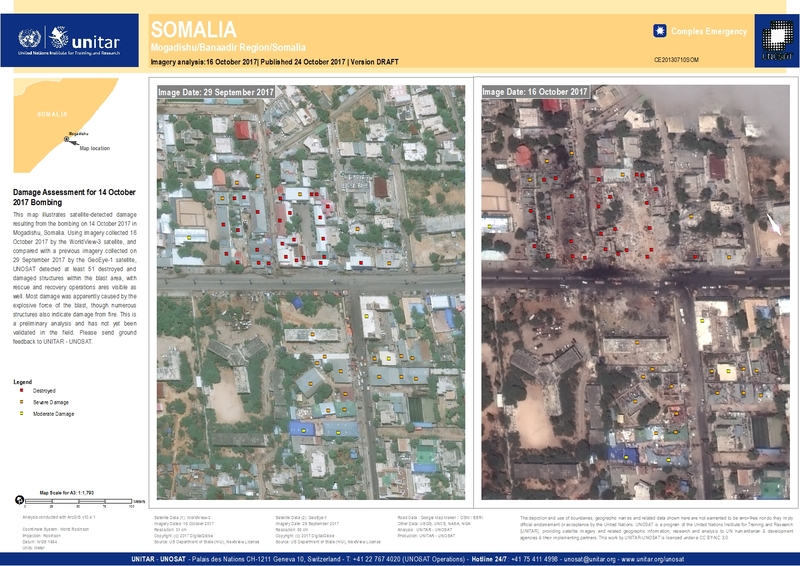 This map illustrates satellite-detected damage resulting from the bombing on 14 October 2017 in Mogadishu, Somalia. Using imagery collected 16 October 2017 by the WorldView-3 satellite, and compared with a previous imagery collected on 29 September 2017 by the GeoEye-1 satellite, UNOSAT detected at least 51 destroyed and damaged structures within the blast area, with rescue and recovery operations ares visible as well. Most damage was apparently caused by the explosive force of the blast, though numerous structures also indicate damage from fire. This is a preliminary analysis and has not yet been validated in the field. Please send ground feedback to UNITAR - UNOSAT.